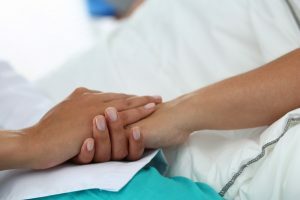 The National Comprehensive Cancer Network (NCCN) recommends that ovarian cancer patients should be initially treated with surgery and chemotherapy. Around 75 percent of women with advanced stage disease who receive this regimen go into remission. Treatments are based on the cancer stage and each patient’s individual needs. Some women diagnosed with stage I cancer localized to a single ovary may opt to only have that ovary and fallopian tube removed. This is sometimes called fertility-sparing surgery. In some women with advanced stage III or IV disease, a surgeon will recommend chemotherapy before surgery (called neoadjuvant therapy) to reduce the size of the tumors so they can be removed more easily during the debulking surgery. The standard of care treatment includes a platinum drug, like carboplatin, a taxane, like paclitaxel (Taxol) and sometimes bevacizumab (Avastin) to inhibit blood vessel growth. This table lists the most commonly used treatments for women diagnosed with advanced ovarian cancer. Groups of drugs are used in combination and are taken either before (neo-adjuvant) or after surgery. These drugs are listed in the National Comprehensive Cancer Network (NCCN) guidelines as preferred treatment options. Please take this information to your doctor as an aid for your discussions. Paclitaxel (Taxol) Drugs can be given by vein (iv) or directly into the peritoneal cavity (ip) on different schedules (weekly, every three weeks). The outcome of the debulking surgery (optimal vs. sub-optimal*) will influence the choice of regimen. There are other treatments, including PARP inhibitors and immunotherapies, being evaluated in clinical trials for initial treatment of ovarian cancer. Visit the clinical trials page and scroll down to find them. These tables list the drugs most commonly used for maintenance after first-line treatment. These drugs are listed in the National Comprehensive Cancer Network (NCCN) guidelines as preferred treatment options. Please take this information to your doctor as an aid for your discussions. With the recent approval of olaparib (Lynparza) as maintenance therapy following first line treatment, testing of the blood for germline (hereditary) mutations in the BRCA1 and 2 genes is important – even if there is no family history. If negative, tumor testing can be performed to determine if a BRCA mutation is found only in the tumor (called “somatic”). The Clearity Tumor Blueprint will check for the presence of a BRCA mutation as well as provide additional helpful information about the tumor’s molecular characteristics. To see side effects associated with this drug, click here. There are other treatments, including other PARP inhibitors and vaccines, being evaluated in clinical trials for maintenance treatment after first-line therapy. Visit the clinical trials page and scroll down to find them.